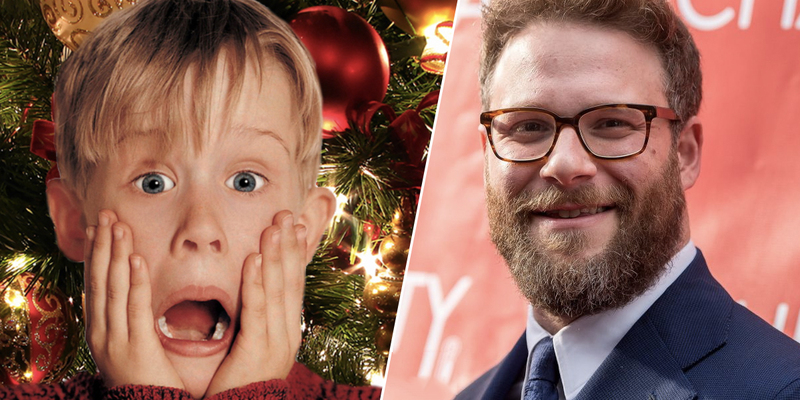 Beloved comedy icon Seth Rogen isn’t likely to be on Santa’s nice list next year after ‘ruining’ Christmas for Home Alone fans. The Pineapple Express star caused a festive stir on Twitter earlier this week when he let slip that the gangster film, Angels With Filthy Souls, that Kevin McCallister (Macaulay Culkin) watches in Home Alone isn’t a real movie. Now I don’t know what prompted the 36-year-old actor to let this slip, but you’d think he’d know by now that there are some secrets that it’s your duty as a functional member of society to keep. For example, you don’t go round telling kids that Santa’s just a sozzled family member who gets their Argos bought gifts out of the attic after they’ve gone to bed. No, it’s the solemn duty of those who know the truth behind Angels With Filthy Souls to keep it secret, keep it safe, and let people dream that it’s a real movie. The only explanation is that Rogen didn’t know and decided to deliberately ruin the Christmas of Nineties kids across the world like some weird movie themed Scrooge. I only realised this year when watching Home Alone 2. It's actually a little devastating. It’s a testament to the level of secrecy and the dedication of those who know the truth to see quite how many people didn’t realise Angels is fake. Even a few of Hollywood’s glitterati didn’t realise, including Chris Evans, Nick Kroll and the star of Home Alone himself Macaulay Culkin! I must confess I’ve been an Angels secret keeper for a few years now, ever since I did some research into the making of Home Alone for a feature. For those interested (and why wouldn’t you be interested) Angels With Filthy Souls is a one minute and 20 second short which was shot in a school gym in Chicago and was originally called ‘Gangster Film’ in the script. They only decided on the name (a play on James Cagney’s Angels with Dirty Faces) after art director Dan Webster said they needed a label for the tape. I believe the title was decided upon only because we needed to create a label for the tape Kevin puts in the VHS player. Sorry if this has ruined your Christmas, but with Hollywood’s love of remakes it won’t be too long until some studio green-lights a full length adaptation.